Do you have ninja-like skills? Have you ever wanted to try your skills out? Now you can play “Wipeout” just like on TV in your own backyard! Bounce Houses Ohio's very own Toxic Wipeout Inflatable Ball Challenge will be an absolute hit at your next party or special event. Designed to challenge and amuse…The Inflatable Wipeout Game is not only fun for players - but exciting for spectators too! Provide entertainment for everyone. This fun new game features a series of four inflatable custom colored balls which challengers must jump across to reach the other side. Climb up the ladder on one of the side platforms high above the biggest inflatable pit you've ever seen. Then try to cross the course by jumping or running across those big “Toxic” balls. Your goal is to hop across all four big balls to the platform on the other side. But don’t worry if you fall off! This inflatable pit is a super-soft jump zone cushioned by patented Zero-Shock technology. This is a dry piece and does NOT involve water. So challenge all your friends to the Toxic Wipeout Challenge! 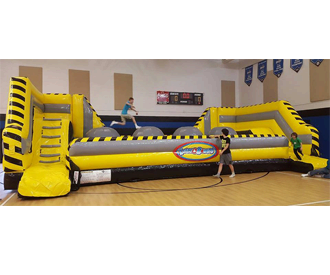 Younger children can certainly do it, however this is a very exciting party rental for Middle School aged children all the way up to Adults. A few ideas for the Toxic Wipeout Ball Challenge would be not only Birthday Parties, but Company Picnics (team building/corporate), School Carnivals, Church Festivals, Summer Camps, College Events, Neighborhood Block Parties and so much more! 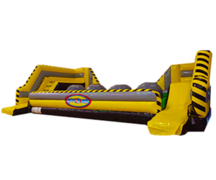 Invite everyone to have a blast with the Wipeout Challenge from Bounce Houses Ohio!